Might be a little behind on the times with this one, since it was an issue from mid-September 2014, however, I thought it was worth a little note. A Pennsylvania newspaper, the Lancaster New Era, ran a cartoon comparing the appalling conditions that African men and women were exposed to. Slave ships spent several months travelling to different parts of the coast, buying their cargo. The captives were often in poor health from the physical and mental abuse they had suffered. The slaves would be both physically and mentally abused in order to keep costs as low as possible whilst transporting them as well as for petty entertainment for the white superiors above deck. 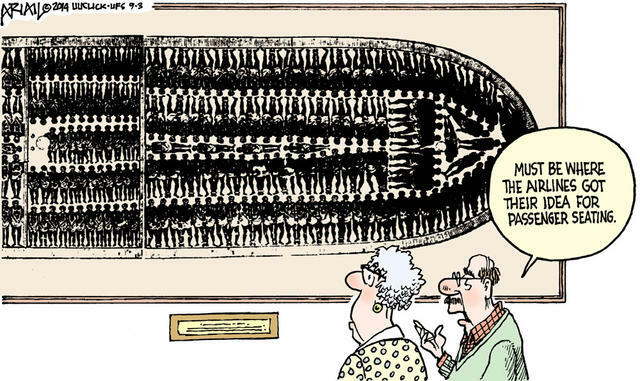 The image below shows Africans being forced to dance aboard a slave ship. They were taken on board, stripped naked and examined from head to toe by the captain or surgeon. Conditions on board ship during the Middle Passage were appalling. The men were packed together below deck and were secured by leg irons. The space was so cramped they were forced to crouch or lie down. Women and children were kept in separate quarters, sometimes on deck, allowing them limited freedom of movement, but this also exposed them to violence and sexual abuse from the crew. The air in the hold was foul and putrid. Seasickness was common and the heat was oppressive. The lack of sanitation and suffocating conditions meant there was a constant threat of disease. Epidemics of fever, dysentery (the ‘flux’) and smallpox were frequent. Captives endured these conditions for about two months, sometimes longer. In good weather the captives were brought on deck in midmorning and forced to exercise. They were fed twice a day and those refusing to eat were force-fed. Those who died were thrown overboard. The combination of disease, inadequate food, rebellion and punishment took a heavy toll on captives and crew alike. Surviving records suggest that until the 1750s one in five Africans on board ship died. This is the cartoon that was published by the Lancaster New Era. At this point I am going to inform you (in case you don’t know) that the newspaper very swiftly ran an apology after a storm of complaints. My personal opinion? Yes, it was tasteless. Yes, it was inappropriate. However, I do not think the paper intended any offence. I simply think they were a little thoughtless. I would love to hear what you think about this, so comment below!